We always enjoy hearing the story behind why someone has decided to invest in custom framing. This piece in particular had been in storage for nearly 50 years! Our client had rediscovered the piece and the minute he saw it, remembered how thrilled he had been when he created it in middle school. He was also surprised to discover he still loved it. 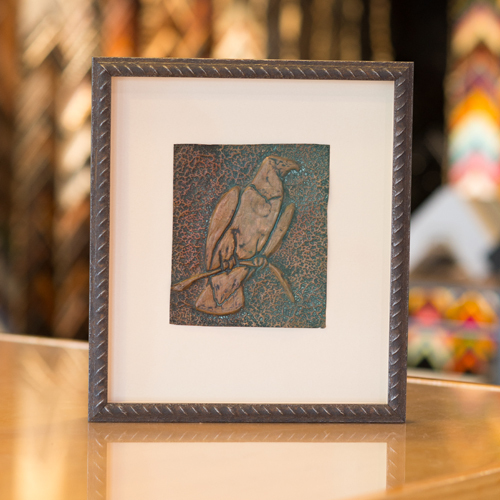 He came in unsure of what he wanted to do, so we looked at many designs and ultimately settled on a shadowbox frame, from Larson Juhl’s Anvil collection, made to look like rusty rebar. The texture and color are a great compliment to his metal art. We used existing holes in the art to hand stitch the piece to an acid free mat and finished the piece with TruVue’s Museum Glass for ultimate uv protection and clarity. We love that the client will be able to enjoy this sentimental piece for years to come and we hope it inspires you to unearth your own treasures to be preserved and displayed.